I start senior year today and I want to make the most out of this year. I want to finish off my high school career with good grades. I also don't want this year to be a stressful one and one way I plan on preventing that from happening is by staying on top of my school work. 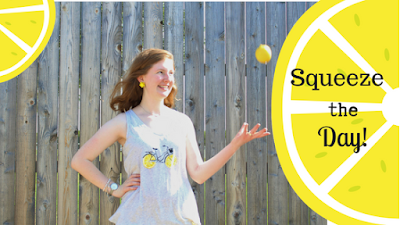 I have a few tips on how you can squeeze each day and how you can be a productive student. 2. Find a fun place to study- you are less likely to be productive when studying in bed and studying at your desk can get a little boring. Try studying at a coffee shop, with a group of friends, or in the library to switch things up a bit! 3. Go to bed on time- it is so important to get good sleep so that your brain can process everything you learned that day and you will have an easier time in class once you have a good night sleep. 5. Don't procrastinate- stay off social media and finish the assignment! 9. Time management- manage your time wisely and don't procrastinate! 10. Eat breakfast- breakfast is so important and it can make a difference in your ability to do good in school! 11. Put homework first- school is so important so make sure you put homework before social event, hobbies, etc. 12. Turn off your phone- don't let your phone be a distraction! Aren't these earring just darling?! The other day my grandma let me go through her jewelry and take some of her clip on earrings. I thought these were so fun! I am loving the yellow trend right now and I think statement earrings are perfect for any outfit. They were my great grandma's before she passed away which makes them even more special! For arm candy I wore my pearl bracelet, James Avery charm bracelet, and my Kate Spade watch. I picked up this cute lemon bicycle tank at Old Navy last summer so it is no longer available to purchase. I thought these yellow gingham shorts completed the outfit! I picked them up at Old Navy a few days ago and they were on clearance for $5! They are a little bit more expensive on their website so if you can, I would recommend going in stores to purchase the shorts.